Explore school-wide systems that can support child-centered and responsive curriculum planning, by enabling educators to observe, reflect on, and develop play-based learning opportunities with. Take a peek behind the scenes, meet with Hilltop’s Mentor Teachers and Administrators, and hear directly from educators about their strategies for facilitating reflective pedagogy. Attend with partners and stakeholders from your program – Mentors, Funders, Educators, and Parents – so you can leave with concrete plans for values-based organizational growth. 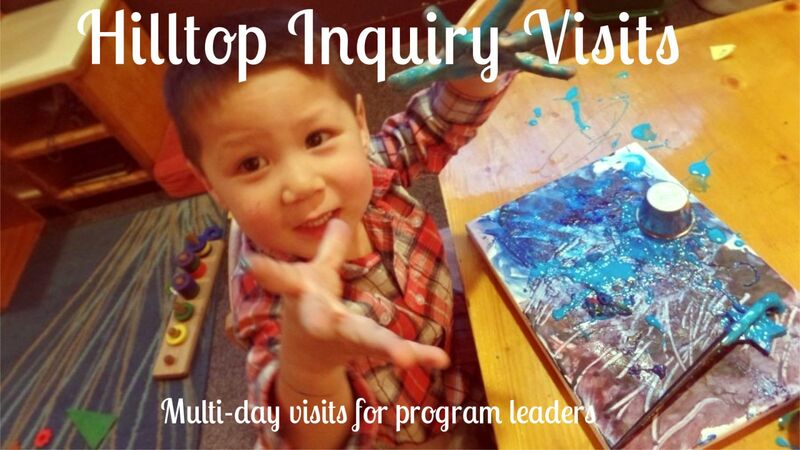 What is an Inquiry Visit? Looking to book an Inquiry Visit? Fill out our form below to request your dates! Inquiry Visit is charged at a hourly rate and a per-participant food/materials fee. Prices varies and are adjusted based on specific objectives of each organization and total number of participants but prices generally start at $2000 for a two-day visit. For a detailed quote, contact us directly. Fill out the form below to be contacted about setting up a Hilltop Inquiry Visit for your group of 6-15* and receive 10% off your group’s registration fees. Please include possible dates, and the tentative number of participants you plan to bring. *Inquiry Visit dates will be selected based on availability of Hilltop Institute Staff. Once a date is selected, the event will be added to the list of upcoming Inquiry Visits on our website. Additional participants from other schools may register to attend the event, up to 15 attendees.